Moroccan Mohamed el-Morabity wins Tunisia’s first ever ultra-marathon in the desert near the southwestern city of Tozeur on October 7, 2017. ONG JMEL (TUNISIE) - Dozens of runners headed into Tunisia's desert at dawn on Saturday for the North African country's first ever ultra-marathon. The 100-kilometre (60-mile) Ultra Mirage El Djerid race, with a course skirting the Sahara desert's biggest salt lake, attracted 58 competitors including eight women and 25 foreign runners. 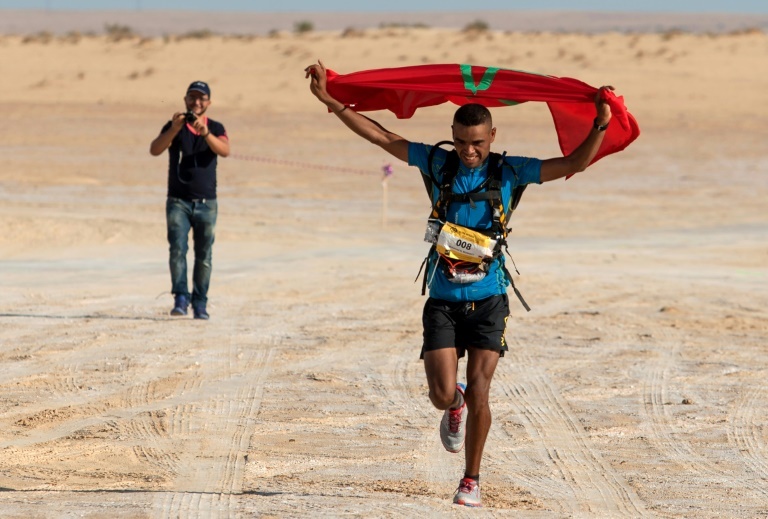 Morocco's Mohamed el Morabity battled his way over dunes, rocky hills and a salt plain to win the race in 8 hours, 48 minutes and 49 seconds. He and his brother Rachid both competed this year at the Marathon des Sables, a famed endurance event in the Moroccan desert which inspired the Tunisian event. The race took place in Tozeur, a southwestern region which served as a set for Anakin Skywalker's village Mos Espa in the Star Wars films. "I think there is a real lack of this type of sporting event in the desert," race director Amir Ben-Gacem said. Organisers hope to make the event an annual fixture on the international ultra-trail circuit, attracting 500 runners annually within three years. "Tunisia is extremely well placed to hold this kind of event," Ben-Gacem said. "We have the beauty of southern Tunisia and we have all the infrastructure to do it."